This made-in-Germany USB interface PCMCIA card drive supports ATA flash PC cards, Linear flash PC cards, SRAM PC cards, and Secure Digital (SD) cards. It adds one standard 16-bit PCMCIA card slot and one standard SD card slot to desktop and notebook computers through a USB port. This feature allows computers to read and write SD card and 16-bit PCMCIA cards including SRAM card, ATA Flash card, Linear Flash card, and ATA hard disk. It also supports special Multimedia cards (e.g. Siemens Simatic MicroMemoryCards, Siemens FMC Cards.) The PCMCIA card slot can also read and write other smaller form flash memory cards such as CompactFlash (CF) in combination with an appropriate PCMCIA adapter. This USB to SD & PCMCIA memory card adapter, CSM OmniDrive USB2 LF/SD, accepts SD card and Type I (3.3 mm thick) and Type II (5 mm thick) 16-bit PCMCIA memory PC cards. Users can connect this PCMCIA & SD card drive to USB 1.1 or USB 2.0 port of a laptop (notebook PC) or desktop computer, to operate Secure Digital (SD) and 16-bit PCMCIA memory cards including ATA Flash, ATA hard drives, Linear Flash, and SRAM card. It also read/write CompactFlash (CF) in combination with a PCMCIA-CF adapter. [Note: OmniDrive USB2 LF/SD does not support 8-bit PCMCIA memory cards, 32-bit PCMCIA CardBus PC cards, and 16-bit non-memory-type PCMCIA PC cards.] To read/write 8-bit PCMCIA memory cards, please click here. 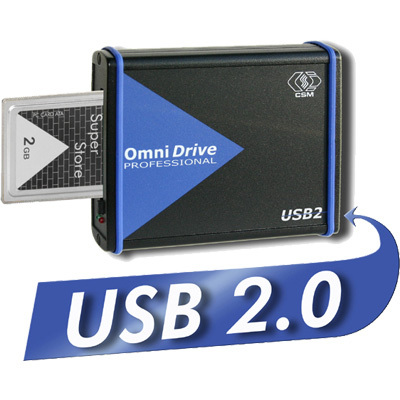 CSM OmniDrive USB2 LF/SD memory card drive works with Microsoft Windows 98 / ME / 2000 / XP / Vista / 7 / 8 / 10 [32-bit & 64-bit]. Supports SD card and Type I (3.3 mm thick) and Type II (5.0 mm thick) PCMCIA cards.